Dr. Andrew Roberts is a renowned Churchill scholar. He has written or edited twelve books, and appears regularly on radio and television around the world. His biography of Neville Chamberlain’s and Winston Churchill’s foreign secretary entitled The Holy Fox was published in 1991, followed by the controversial, but no less well-received Eminent Churchillians in 1994. January 2003 saw the publication of Hitler and Churchill: Secrets of Leadership, which coincided with Roberts’s four-part BBC2 history series. Masters and Commanders, which was published in 2008, won the Emery Reves Award of the International Churchill Society and was short listed for The Duke of Westminster’s Gold Medal for Military History and The British Army Military Book Award, both of Britain’s two top military history prizes. In April 2012 he was awarded the William Penn Prize. 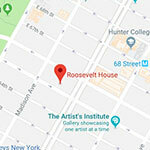 This lecture, part of The Tina Santi Flaherty-Winston Churchill Literary Series, is presented in partnership with The Roosevelt House Public Policy Institute at Hunter College, and The Writing Center at Hunter College. 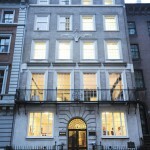 The series will continue at Roosevelt House in September 2012.